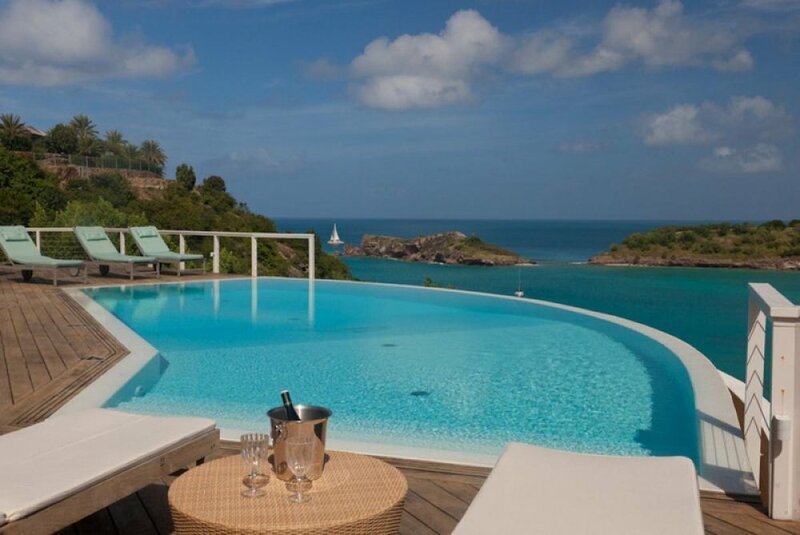 This villa is perfect if you want a mostly private beach, six spacious suites, and open interiors. For extra touches of luxury, there’s a staff and a media room with a plasma HDTV. I would highly recommend Galley Bay #020 for a family vacation thanks to its various suites, guest cottage, and common areas. Galley Bay Heights Villa - #020 is a six-bedroom property above Galley Bay’s private beach. This villa is staffed with a gardener, pool maintenance, and a housekeeper for a relaxing experience. A local stone pathway leads to the private beach below, and Deep Bay is only a ten minute drive away. The villa’s outdoor living space has comfortable furniture, panoramic views, and lush pool level and rooftop gardens. The veranda holds a large, professional-grade BBQ grill, a bar, a dining area, lounge chairs, and sofas with a coffee table. The infinity-edge pool curves with the bay, and the circular Jacuzzi is nearby. Sliding glass doors along the veranda lead into the living and dining room. The villa offers over 10,000 sq. ft. of air-conditioned living space on two levels. The living room’s oversized sofas, vaulted ceilings, and overhead sky window create space to lounge and relax, while the TV room’s 60” plasma HDTV, sound system, and sectional create space to enjoy movie nights. A sugar mill replica separates the living room from the dining room, and the fully equipped kitchen boasts professional grade appliances, Italian marble countertops, and custom made Italian cabinets. All six of Galley Bay’s bedrooms have air-conditioning, an ensuite bathroom, and exterior access through French doors. Three of the villa’s suites are on the main level, two are on the lower level, and one is in the cottage. Two of the main level suites have king beds and the third has a queen. One of the king suites also has a tub in its ensuite bathroom. All three suites have access to the pool deck. On the lower level, there’s a children’s suite with two twin beds and a queen suite that both open to a private veranda. The sixth suite is in a separate cottage with a queen bed, a kitchenette, a living room, and its own veranda. Galley Bay Heights is a secluded, residential community only 10 minutes from St. John’s capital and 20 minutes from the V.C. Bird International Airport. There’s several restaurants on the adjacent peninsula, just a short drive away. The private beach of the Galley Bay Heights compound is located via steps, just down from the villa. The beach of Galley Bay is at a short walking distance or few minutes by car, while the beach of Hawksbill is about an eight minute drive and the beautiful Deep Bay, the one you will admire from the property, is about a ten minute drive.